January 4, 1944 – World War II: Operation Carpetbagger, involving the dropping of arms and supplies to resistance fighters in Europe, begins. 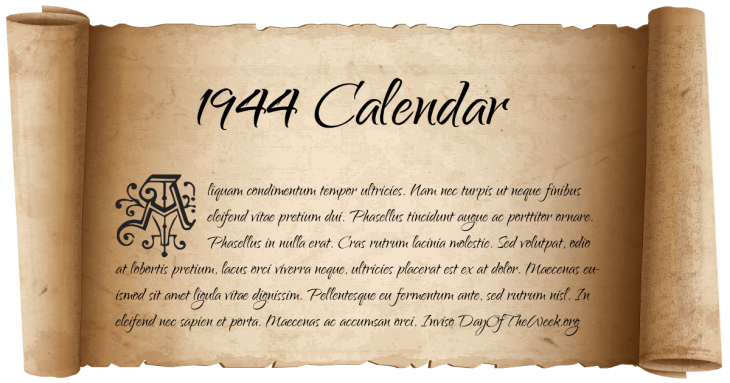 January 25, 1944 – New Year’s Day in Chinese calendar. Start of the year of the Wood Monkey in Chinese astrology. February 3, 1944 – World War II: During the Gilbert and Marshall Islands campaign, U.S. Army and Marine forces seize Kwajalein Atoll from the defending Japanese garrison. June 13, 1944 – World War II: Germany launches a V1 Flying Bomb attack on England. Only four of the eleven bombs actually hit their targets. August 22, 1944 – World War II: Romania is captured by the Soviet Union. October 2, 1944 – World War II: German troops end the Warsaw Uprising. October 7, 1944 – World War II: Uprising at Birkenau concentration camp, Jewish prisoners burn down the crematoria. October 8, 1944 – World War II: The Battle of Crucifix Hill occurs on Crucifix Hill just outside Aachen. Capt. Bobbie Brown receives a Medal of Honor for his heroics in this battle. October 23, 1944 – World War II: Battle of Leyte Gulf – The largest naval battle in history begins in the Philippines. October 25, 1944 – Battle of Leyte Gulf, the largest naval battle in history, takes place in and around the Philippines between the Imperial Japanese Navy and the U.S. Third and U.S. Seventh Fleets. Who Were Born On 1944? December 25, 1944 – Nigel Starmer-Smith, English Rugby Union commentator.